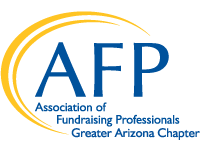 The Association of Fundraising Professionals Greater Arizona Chapter is the premiere organization for fundraisers and nonprofit professionals in the Phoenix-Metro region. We currently represent nearly 300 members from the leading nonprofit charities, foundations, and consultants across the Valley. Whether you’re already a member, looking to join, or just learning more about us, we’re glad you’re here! Please take a look at our many offerings. The Greater Arizona Chapter of the Association of Fundraising Professionals advances philanthropy by fostering the development and growth of fundraising professionals and promoting ethical and effective fundraising standards. The vision of the Greater Arizona Chapter of the Association of Fundraising Professionals is to be the leader and resource in strengthening the fundraising profession and the philanthropic community. Important changes to giving guidelines for 2019! Donate to AFP Greater AZ!